I’m a fan of early Craftsman hand planes made for Sears. Part of the appeal, I think, is that they’re rebranded versions of tools from major manufacturers and it’s kind of fun figuring out who made what for Craftsman. (There’s an excellent article on this topic over at TimeTestedTools.net, by the way.) If you’re hunting for a bargain on a plane, you can sometimes pick up an identical version for less money if you know what to look for. As an example, take a look at my Craftsman 3728 combination plane, which is a rebranded Stanley 45. 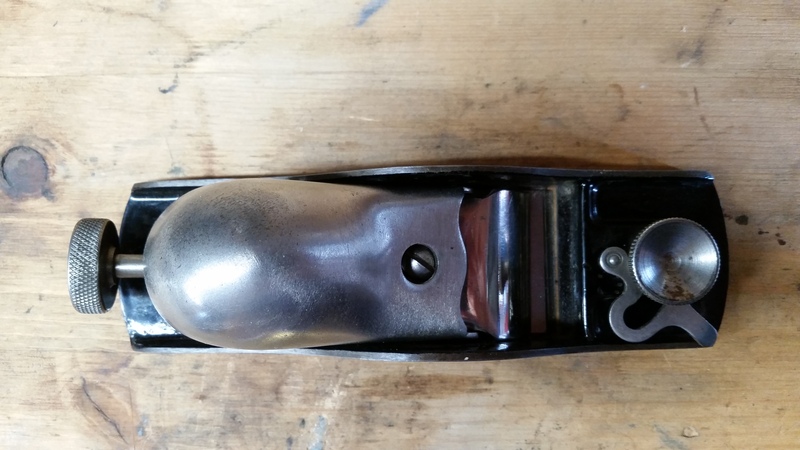 In today’s entry, I’d like to show off my Craftsman 3732 low angle ‘knuckle’ block plane. Right side of no 3732. Top view of no. 3732. 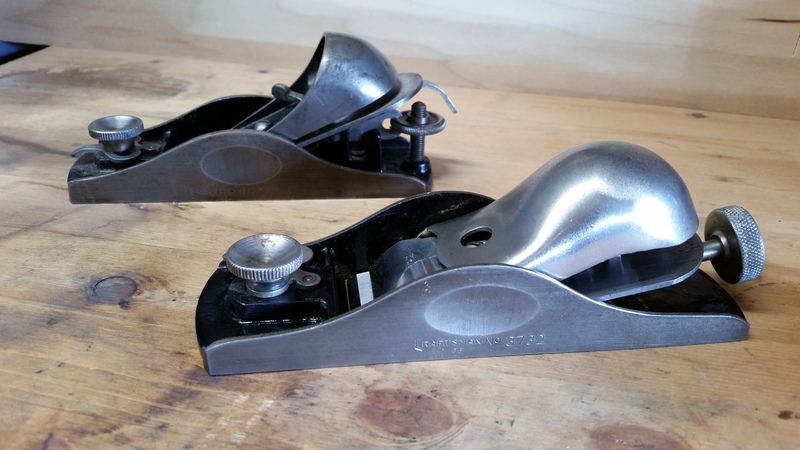 The earliest Craftsman planes were marked with ‘BB,’ ‘BL,’ or ‘DD,’ which correspond to their manufacturers: Millers Falls, Sargent, and Stanley, respectively. 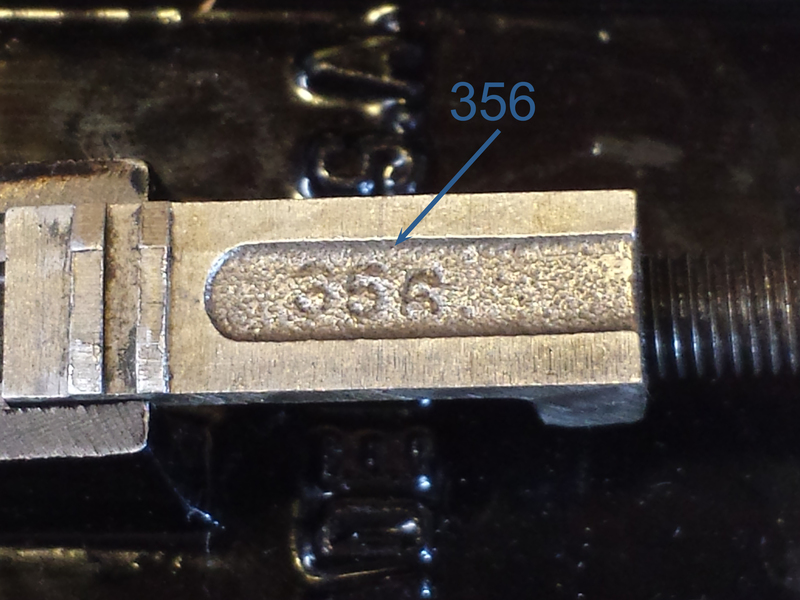 My block plane was stamped with a ‘BB’ designator on the iron as well as on the plane body, underneath the model number. The ‘BB’ code indicates a Millers Falls manufactured plane. The plane is clearly the same as a Millers Falls no. 47, which you can see illustrated in this 1938 MF catalog. There are a few minor differences between my plane and the illustration, such as the thickness of the rear adjuster knob and the style of knurling on the front knob, but I believe these are just parts variations (types?) that occurred over the lifetime of the model. The knurling on the rear knob is fine and matches what’s on the thicker Craftsman plane’s knob. Millers Falls no. 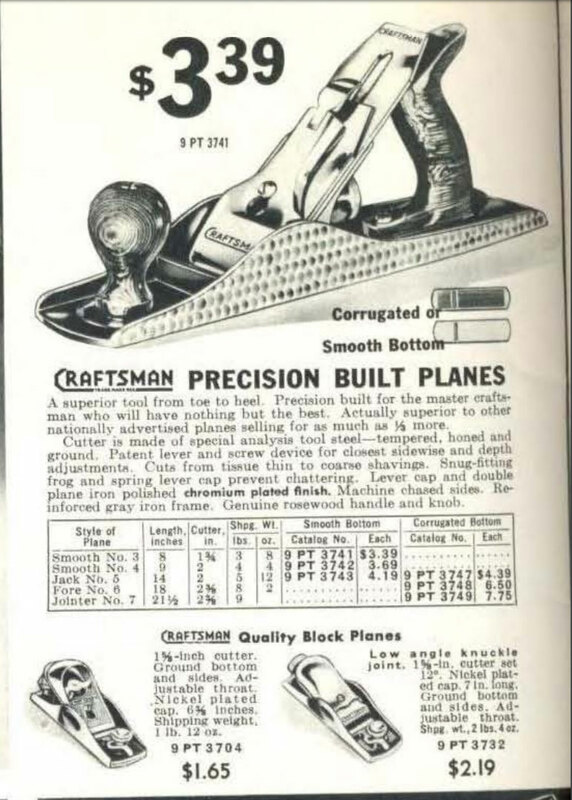 47 Block Plane, from the 1938 Millers Falls catalog (cat. no. 42). Stanley 65 breakdown (ebay seller’s photos). The rear adjustment knob on the CM 3732 has finer knurling compared to the Stanley 65’s coarse knurling. 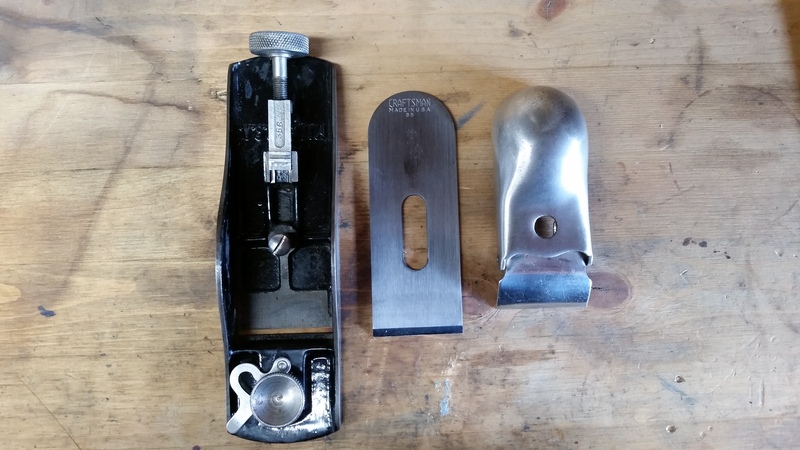 The knob itself is thicker in the Stanley 65 and Craftsman 3732 compared to the illustration of the Millers Falls 47 shown above. 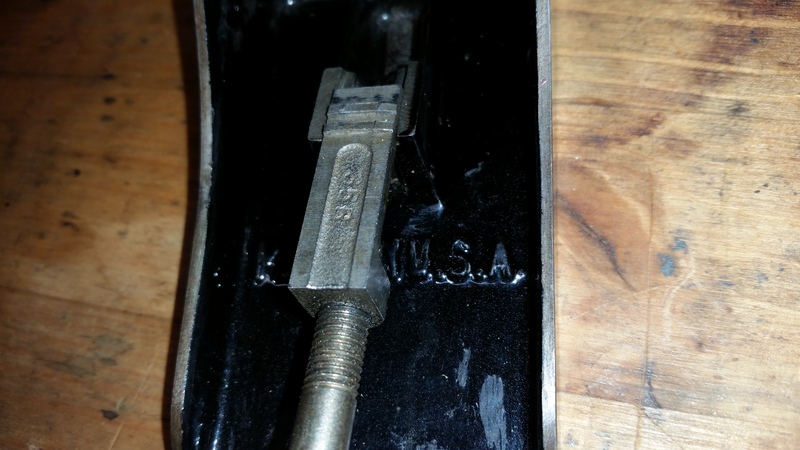 The front knob on the Stanley 65 appears to be brass, or possibly just had some nickel plating removed, but I think it’s brass. It also has either a light vertical knurling or no knurling (I can’t tell from the photo, and I don’t own one to compare). The iron has horizontal adjustment grooves that are more numerous on the Stanley 65 (11 grooves) than the CM 3732 (seven grooves). Otherwise, the irons are pretty similar. The knuckle cap appears virtually identical between the brands. The bed of the CM 3732 has a more extensively machined surface for the iron to ride on than the Stanley 65, which may be somewhat of an improvement. You can see that even better in the photo below. 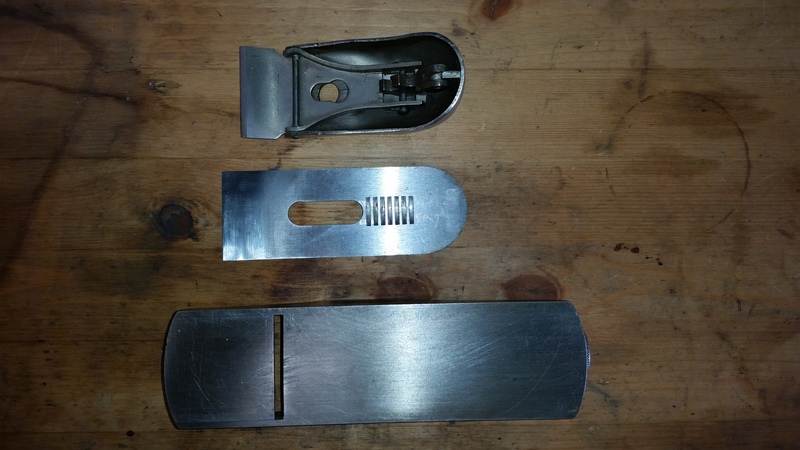 There are minor, but notable differences between the iron adjuster hardware for both planes. The CM 3732 appears to have more machining done to the surfaces the iron rests on. It might be a bit of an improvement over the Stanley 65, but they’re pretty similar. There are also some different foundry marks on various parts between the brands, but I wouldn’t be surprised if some of the parts were even interchangeable (pure speculation on my part). 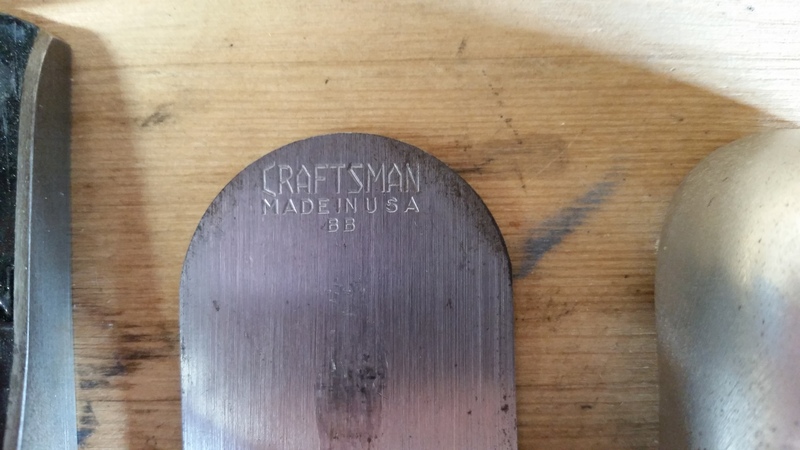 Craftsman 3732 foundry marks in the movable sole. Craftsman 3732 foundry marks on the iron adjuster. Despite the minor differences between the Millers Falls 47 / Craftsman 3732 and the Stanley 65, I think they’re basically the same plane *cough* shamelessknockoff *cough*. The Stanley 65 is a very well-regarded plane, so if you’re looking to save a few bucks, consider trying a Craftsman 3732 instead. 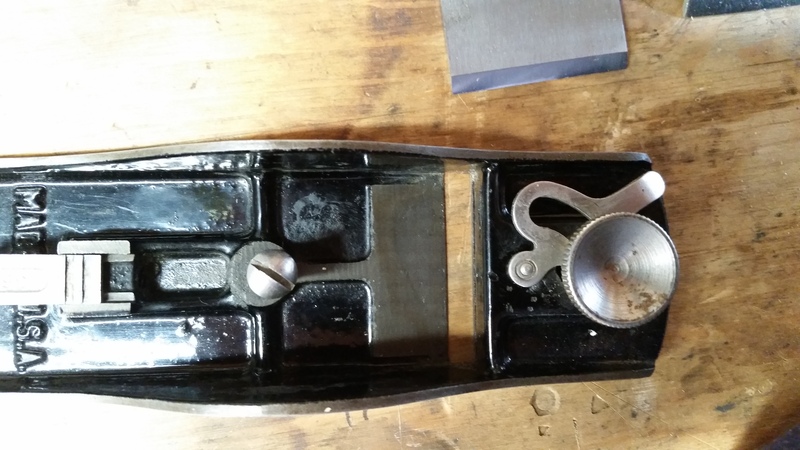 I have another early Craftsman block plane, a Millers Falls-made Craftsman no. 3704, which I’ll probably talk about at some point. Both planes were contemporaneous. Craftsman 3732 (foreground) and Craftsman 3704 block plane (background). The earliest Sears catalog in which I have seen the Craftsman no. 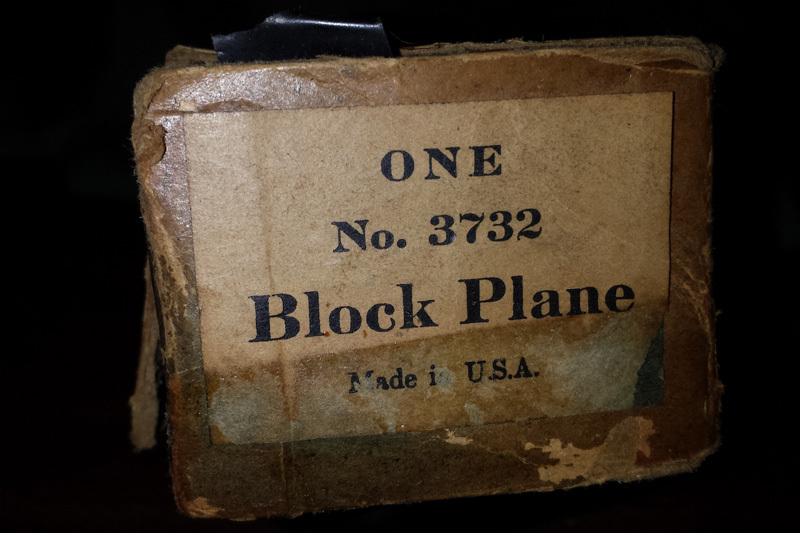 3732 in was the 1941 catalog, which listed the plane as a ‘low angle knuckle joint plane.’ It’s possible that it was offered earlier, and I just haven’t seen the right catalogs. That would certainly jive with the very early Craftsman logo on my plane. Interestingly, the fully-underlined Craftsman logo appears to be included on the knuckle joint cap in the catalog illustration. My example lacks any logo on the knuckle cap, so perhaps I have a later issue. My plane does have a logo on the side below the oval. That logo is the non-underlined variant logo from the same era as the underlined logo. I’m not sure if it was merely a variation or a size constraint issue. 1941 Sears catalog showing no. 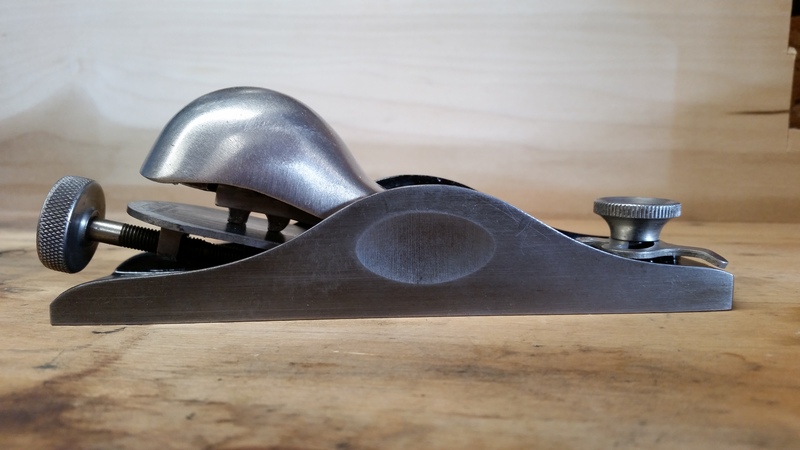 3732 block plane for sale. If you find the 1941 illustration difficult to read, it says that the cutter is 1-5/8 in. and was ground to 12 degrees. The cap was nickel-plated. 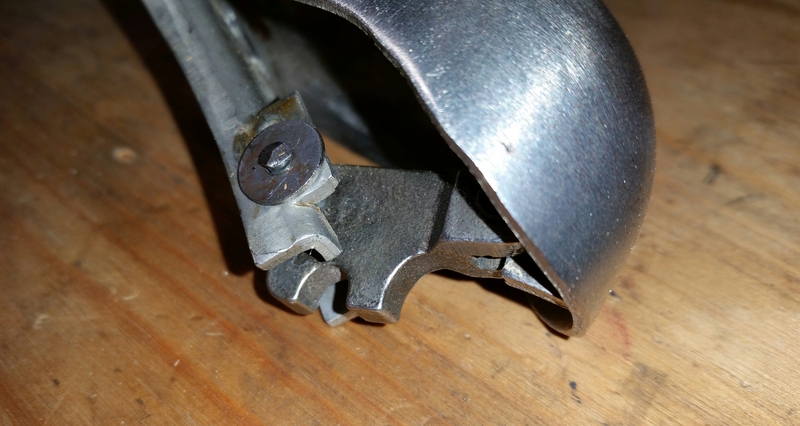 The overall length was 7 in. The sides and bottom were ground flat. The throat was adjustable. Overall shipping weight was 2 lbs 4 oz. $2.19 in 1941 was approximately $37.50 in 2017 dollars – affordable, but not really cheap. 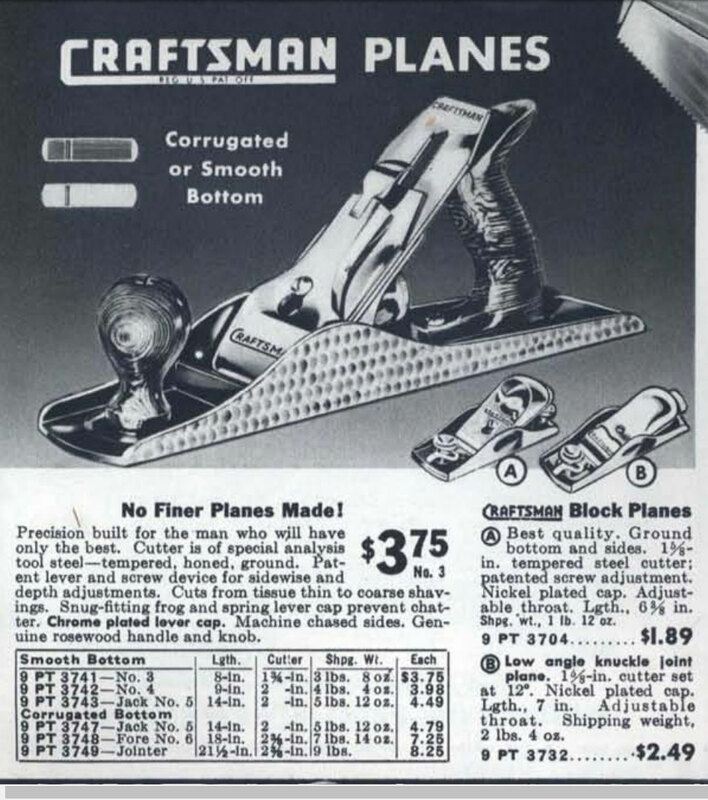 The 3732 block plane also appeared in the 1942 catalog. The no. 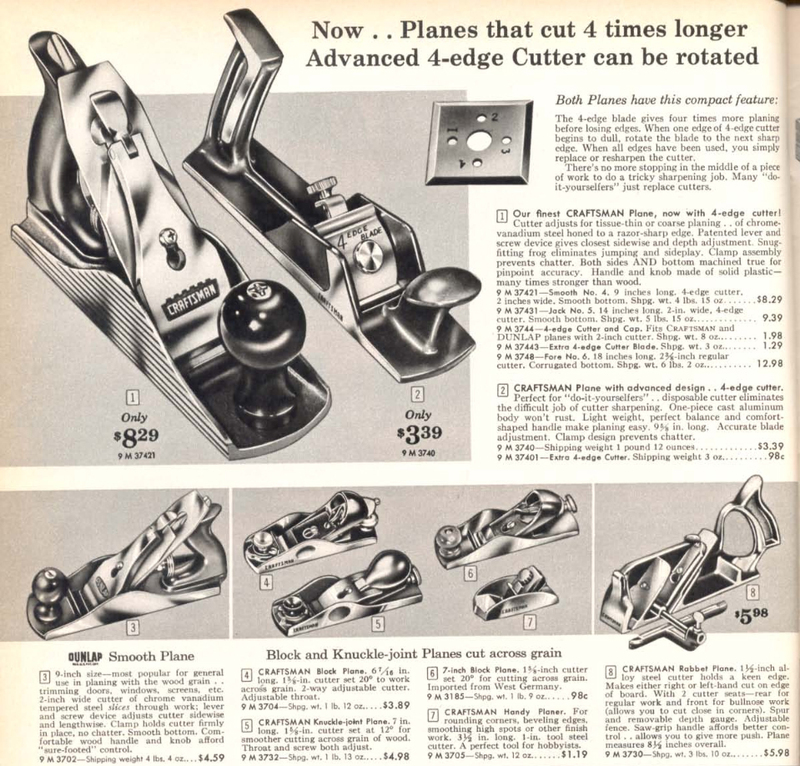 3732 plane was still listed in the 1957 Sears catalog. By 1957, the illustration indicates that they dropped the Craftsman logo on the cap. 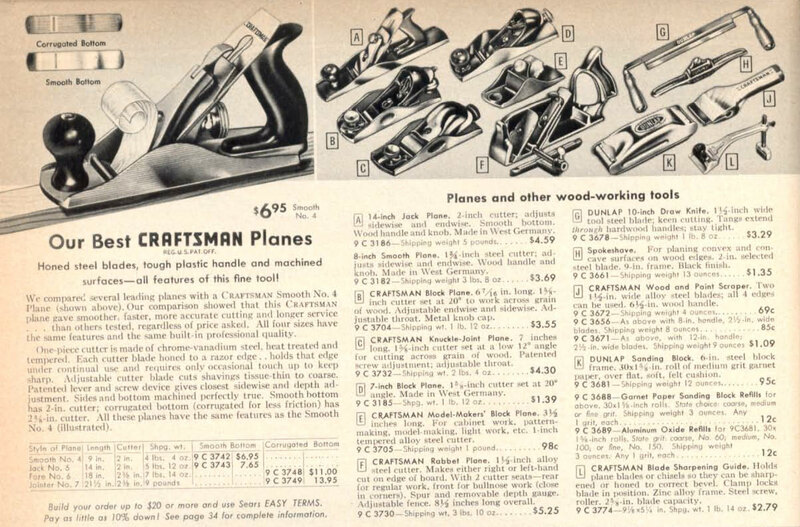 In 1960, the Sears catalog indicates a major change in the Craftsman 3732, due to a change in manufacturer. Later planes have a ‘BL’ stamp, indicating that it was manufactured for Craftsman by Sargent. 1960 Craftsman catalog, showing the Sargent-made Craftsman 3732. Below, you can see some ebay photos for illustration. The plane doesn’t appear to have ‘CRAFTSMAN’ written anywhere except the iron. The BL code indicates Sargent was the maker. I believe these were copies of the Sargent no. 4307 knuckle joint block plane. There are a number of obvious differences between the Millers Falls ‘BB’ Craftsman model and the Sargent ‘BL’ Craftsman model, most obviously in the shape of the knuckle cap, the means of adjusting the iron, and the mouth adjustment. 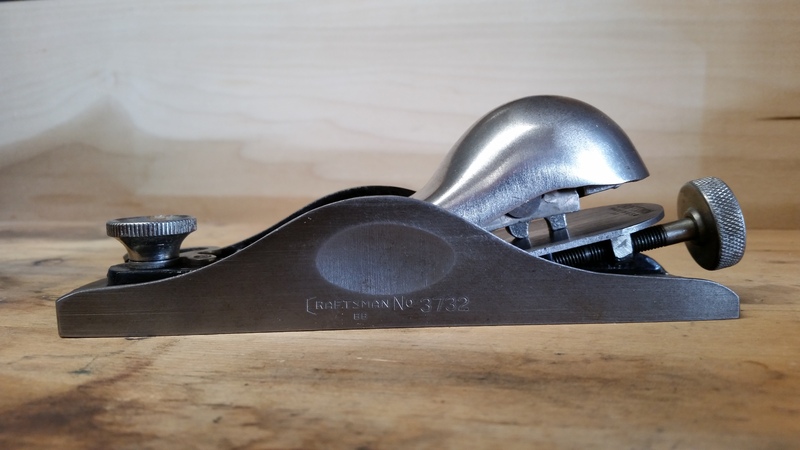 I hope everyone enjoyed this examination of the Craftsman 3732 knuckle joint block plane. I’d welcome any further comments from those of you with experience with these early Craftsman planes. The knuckle on my Craftsman 3732 is painted black. Did some come this way? 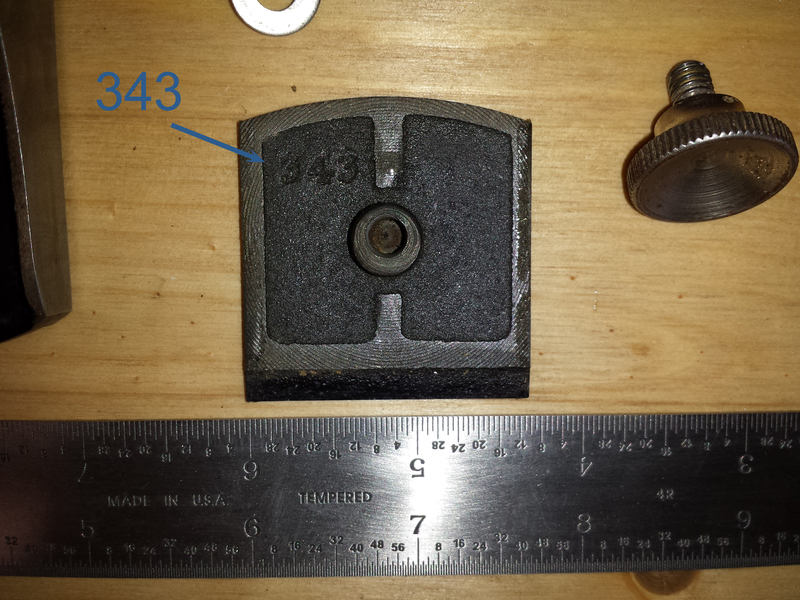 I can’t say for sure that Craftsman never did that, but I’ve never seen a black-painted 3732 knuckle cap. I think they painted some of their other models – so who knows? But my impression has always been that they’re polished and plated. 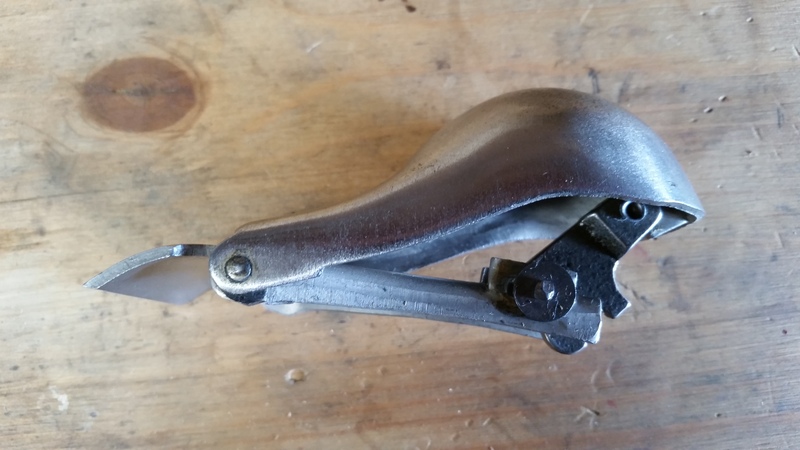 Craftsman sure has done some odd things in the past (or rather, their suppliers have). Thanks for visiting, sorry I couldn’t help more on this one!